Send and track digital gifts to boost response and conversions. IT’S LIKE DIGITAL SWAG, BUT BETTER. Ever brought a t-shirt, a flash drive or candy to a trade show to entice customers to stop by your booth? Savvy marketers have always understood the power of marketing gifts to attract and keep customers. 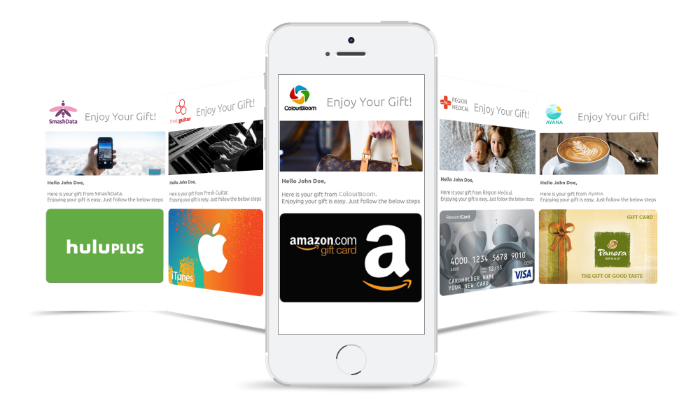 Now you can use digital gift cards and e-gifts to support and boost your online, email and social media marketing campaigns. Delivery is instant, exciting and trackable, generating gratitude and unique opportunities for follow-up and engagement. Simplify your incentives management process into one, comprehensive tool. Take the pain and cost out of sending rewards for surveys and research. Deliver incentives by email as a digital gift card like Amazon.com or international Visa pre-paid card. Rybbon automatically tracks and organizes everything by projects. And ensures you never waste budget on unclaimed rewards. Rybbon delivers gifts from your trusted email address with your personal touch. Make a lasting impression by customizing the gift email, landing page and domain name with your own brand, messages and images. Setup a curated selection of digital gifts and e-donations and let your recipients select their preferred gift or donate to the charity of their choice. Now everyone, from the musician to the athlete, can get exactly what they want! Savvy marketers have already adopted Rybbon…and love it. No Setup Fees. No Minimums. Only pay for the gifts.